It will be the 129th Wimbledon final (2nd most of all-time), the 48th Wimbledon final in the Open-era (most in the Open-era tied with French Open). Who will win the 129th (all-time) and 48th (Open-era) Wimbledon Championships? Djokovic will be the FIRST who defends his title since 2007? Djokovic will be the FIRST who defends his title in this decade? Djokovic will be the 20th No.1 seeded player who will win the title in the Open-era? Djokovic will equal his coach’s number of titles in Wimbledon? In 2007 and in 2011, the AO champ won Wimbledon. In 2015 will be the same? The winner will come from the upper or the lower half of the draw? Will Roger Federer be a sole record holder of Wimbledon with 8 titles? Djokovic will be the 5th player in the Open-era who reaches his 200th match wins at Grand Slams? Wimbledon has the lowest match with a retirement in the Open-era (109). It will be the 110th match with a retirement or after 2012 it will be another championship without any retirement? Last year, record-high 80 matches were played with at least one tie-break in Wimbledon. 62,5% of the matches will result again at least one TB? 2926 days ago happened LAST TIME when a champion could defend his title (2007, Roger Federer). 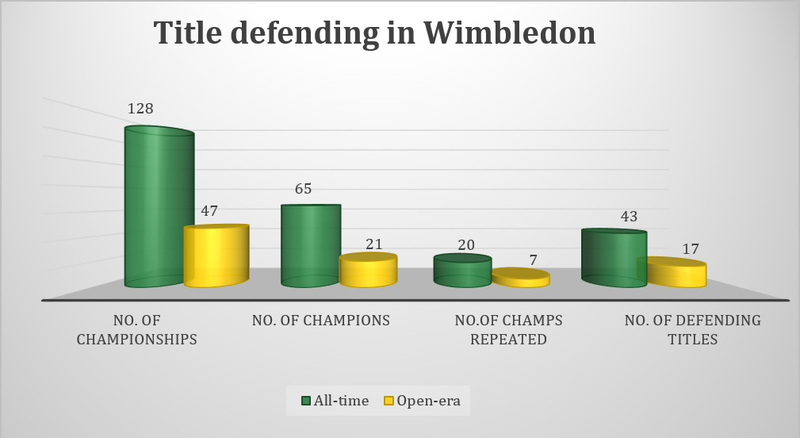 Since 1880 in Wimbledon, there was at least one player in each decade who defended successfully his title, except the 1940s (between1940-45 there was no competition due to WWII). Djokovic will be the FIRST champion who defends his title in this decade in Wimbledon? Djokovic was able to defend his title (2012-13) ONLY in Melbourne during his career. If Djokovic wins in Melbourne, there is 50% chance to reach at least the final in Wimbledon and 25% chance to win the title in the same year. If the Serb wins the AO title, there is 75% chance to reach the semifinal in Wimbledon in the same year (except in 2008). If he is seeded No. 1 or No. 2 in Wimbledon, there is 100% to reach the semi-final. In 2007 (Federer) and in 2011 (Djokovic), the Aussie Open champ won Wimbledon. In 2015, it will happen again? Roger Federer NEVER played against African, Japanese and Central American players in Wimbledon. ONLY European players beat Roger Federer in Wimbledon. Federer reached his 10th Wimbledon final equaling Bill Tilden’s all-time record. In the Open-era, 19 times of 47 years, the No.1 seeded player won the title in Wimbledon.